조선 후기의 문신으로 사도세자의 신원 등 자기 정파의 주장을 충실히 지키면서 정조의 탕평책을 추진한 핵심적 인물인 채제공의 초상화이다. 수원시 소장 은 채제공 73세상으로 사모에 관대를 한 옅은 분홍색의 관복 차림에 손부채와 향낭을 들고 화문석에 편하게 앉은 전신좌상이다. 우측 상단에 ‘聖上 十五年 辛亥(1791) 御眞圖寫後 承 命摸像 內入 以其餘本 明年 壬子(1792) 粧’이라고 쓰여 있고, 그 아래 ‘畵者 李命基’라고 밝혀 놓았다. 이어서 우측 상단에 채제공이 직접 쓴 자찬문이 있다. 시의 내용대로 정조로부터 부채와 향낭을 선물 받은 기념을 표시하기 위해서인 듯 손을 노출시켜 부채와 향낭을 들고 있는 모습으로 연출되었다. 수원시에 함께 소장되어 있는 유지 초본 3점 또한 중요한 자료이며 향낭도 함께 남아 있다. 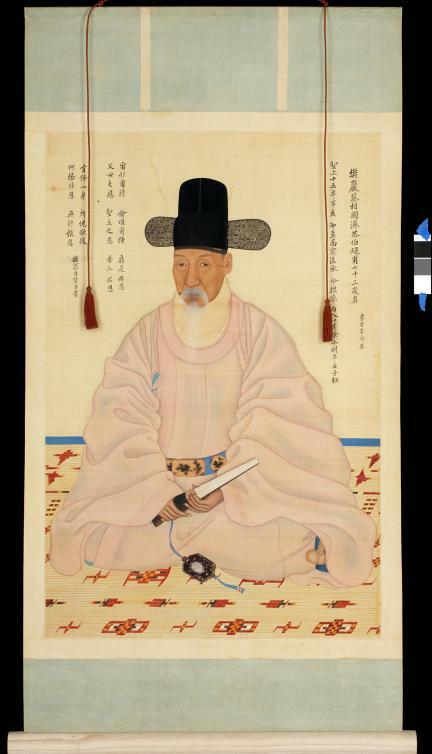 Chae Je-gong (1720-1799) was a renowned civil official of the late-Joseon Dynasty. He faithfully represented the political views of his faction on important issues to recover the honor of Crown Prince Sado, who was unfairly victimized, while playing an instrumental role in King Jeongjo's implementation of his policy of impartiality, by which he accorded equal favor to men of all political stripes in official appointments. This full-length Portrait of Chae in Everyday Official Attire, Treasure No. 1477-1 (possessed by Suwon City), was painted in 1792, when he was 73 years old. It shows Chae wearing a pale pink robe with a sash and a black silk hat, comfortably seated on a figured matt. There are two inscriptions, one of which is a complimentary verse written by Chae himself in the upper right-hand part of the painting. 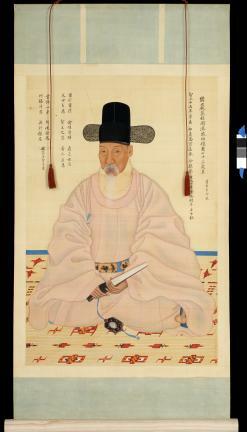 Judging from his complimentary verse, it is assumed that the portrait was painted to celebrate King Jeongjo’s presents (sash and black silk hat) to Chae, which stand out clearly. In addition, three copies of the Sketch on Oil Paper and an incense bag are kept by Suwon City.